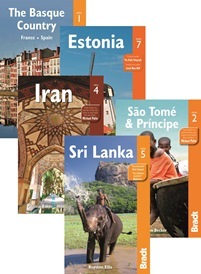 Bradt Travel Guides are aimed squarely at the mature but adventurous traveller. Over the last 30 years the original hiking guides have been replaced by ground-breaking country guides offering in-depth information on culture and natural history, alongside the nuts and bolts of where to stay and what to see. Bradt guides support responsible travel, with advice not only on minimum impact but also on how to give something back through local charities. Thus a true synergy is achieved between enjoying adventurous travel away from the tourist hordes and enabling the local people or wildlife to benefit from the visit. Bradt Publications, bring to the market, many guidebooks to lesser-known destinations, that won't be found with any other publisher.